I officially dismantled my garden last weekend - and considering I live in Northeast Ohio, the fact my garden was still up and sprouting was shocking. Earlier in the season I picked the biggest zucchini I have ever seen, a massive nearly-ten pound behemoth that was as big as Theo! Ever since that day, I've been trying to use this massive zucchini up in whatever ways I can, especially because that same day I also plucked another nearly seven pound monster zucchini from my garden. WHAT TO DO WITH ALL THIS ZUCCHINI!?!?! 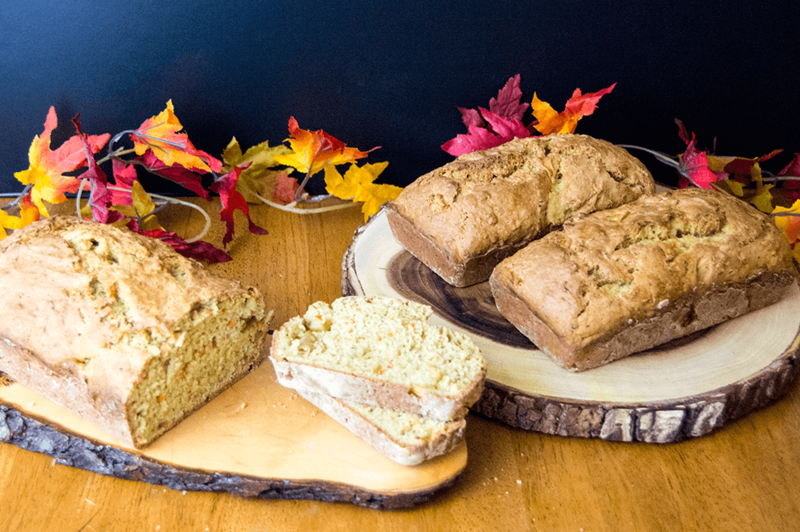 Suddenly, the thought of zucchini bread passed through my head - something I absolutely hated as a kid whenever my dad made it. But since I'm trying to eat everything I hated as a kid as an adult, I figured now would be as good as a time as any to test out a recipe. 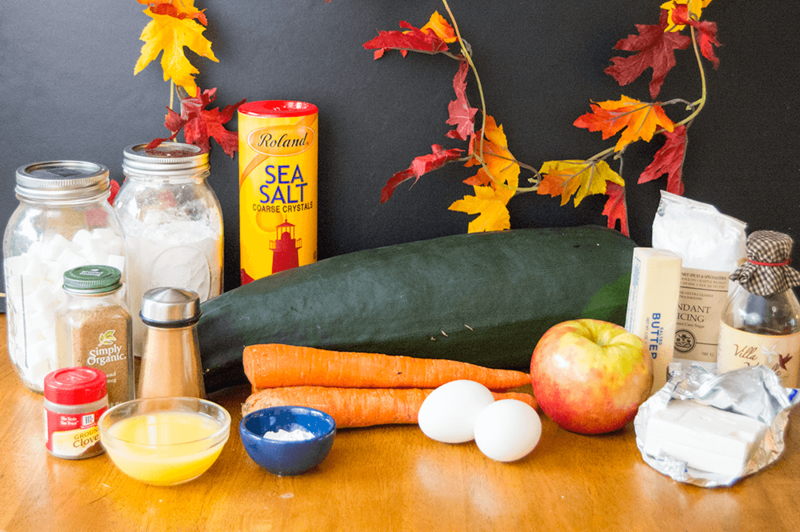 For my zucchini bread, I mixed in a healthy portion of carrots and apples as well. I used my extra large cheese grater to shred the carrots and apples, but because my arms were getting tired, I decided to use my food processor to shred the zucchini. I'm not sure if I just used my food processor incorrectly (totally possible) but I ended up with more of a zucchini puree than shreds. I decided to use it anyways, but just a note, your zucchini does not need to be pureed for the recipe to come out the same. 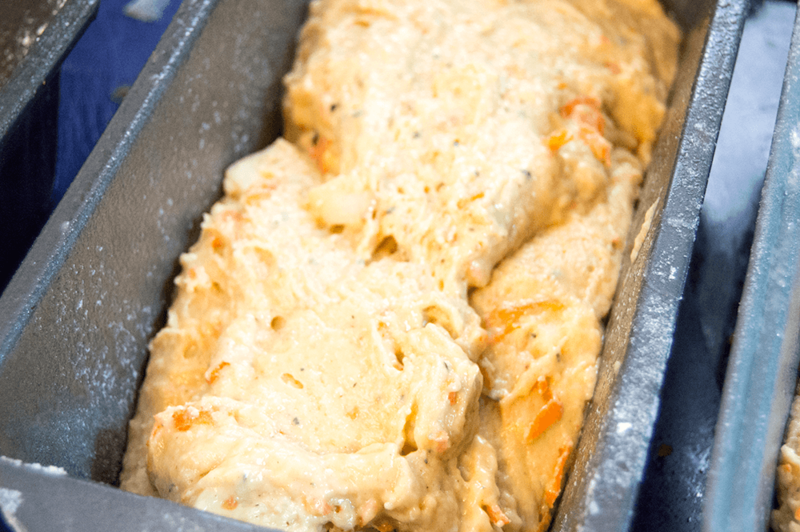 Then I used my stand mixer to stir together the zucchini, carrots and apples with the flour, eggs, butter and spices until a thick, sticky batter formed. I knew I had a lot of bread to make, so I ended up filling up three separate bread pans. I gave a couple to my coworkers, but kept the biggest one to stuff in my own face. Let the zucchini bread cool until it is no longer warm to the touch before you cut into it - otherwise you'll end up with a crumbly mess, which while still delicious, just does not look the same (and therefore in my mind, doesn't taste as good either - I eat with my eyes first!). 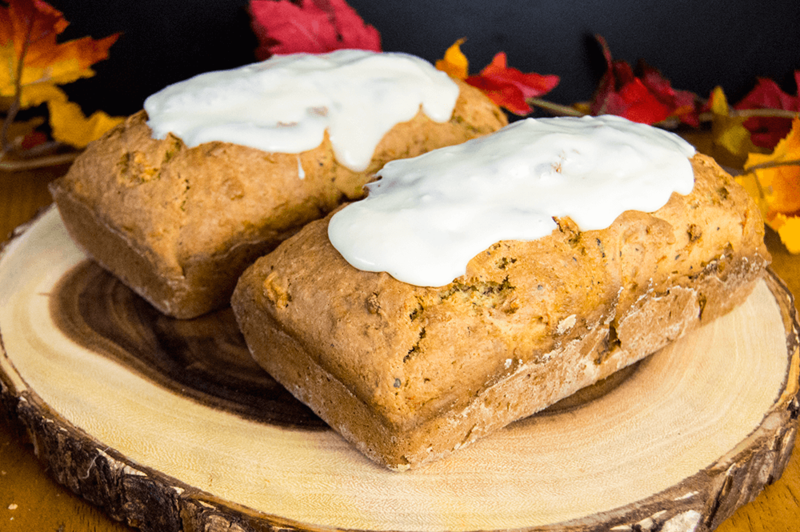 When the bread has cooled completely, whisk together the icing ingredients until a thin icing forms that can be drizzled over the tops of the zucchini bread. 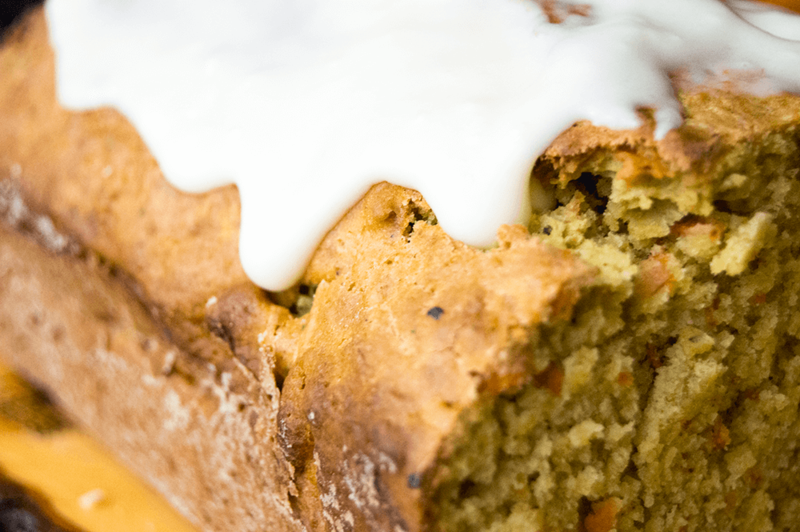 This zucchini bread was actually confused as cake by one of my coworkers husbands - it's that sweet and delicious! Preheat the oven to 375°F. Use a cheese grater with large shredding holes (or a food processor set to 'shred') to shred the zucchini, carrots and apples. In a stand mixer, combine the melted butter, orange juice, sugar, eggs, baking soda, baking powder and spices. 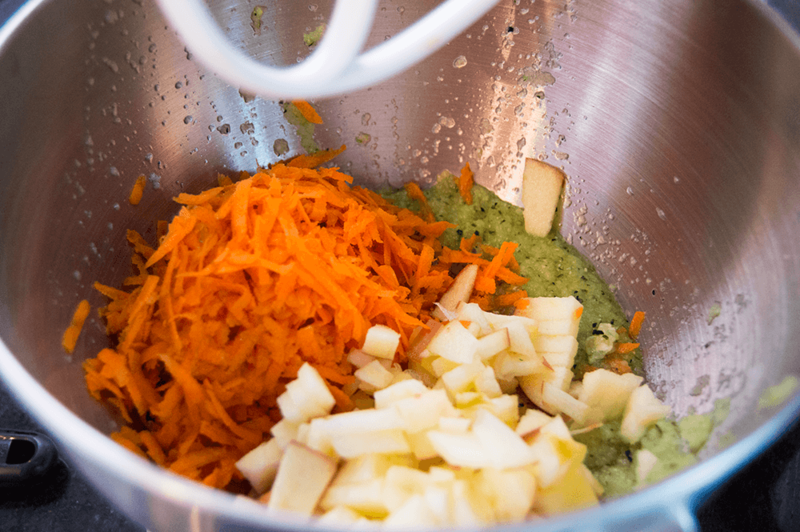 Slowly add the shredded zucchini, carrots and apples until a smooth batter has formed. 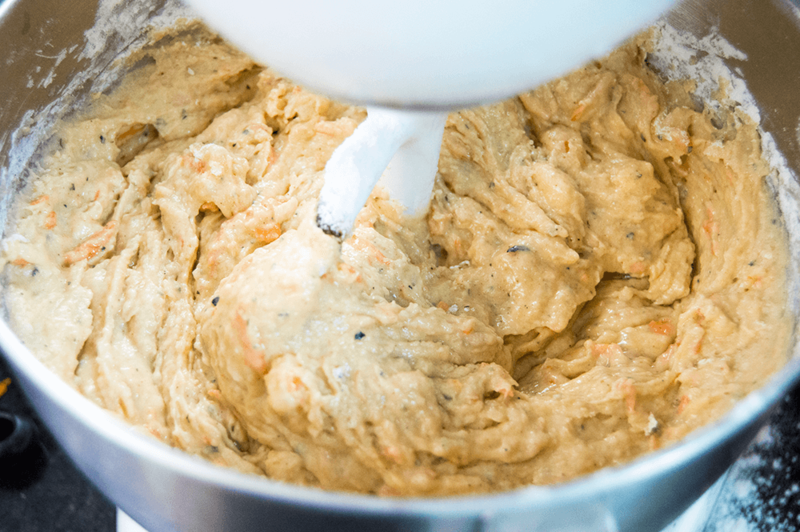 Add the flour 1/2 cup at a time, with the mixer set on a medium-low speed. Continue to add the flour until a thick, sticky batter has formed. Grease 3 bread pans with butter and flour. Pour the batter into each so they are about 2/3 full. Bake for 35-45 minutes or until a toothpick inserted in the center comes out clean. While the bread cools (it's best to cool completely before cutting), use a hand mixer to beat together the cream cheese, butter, vanilla and powdered sugar until a smooth icing forms. 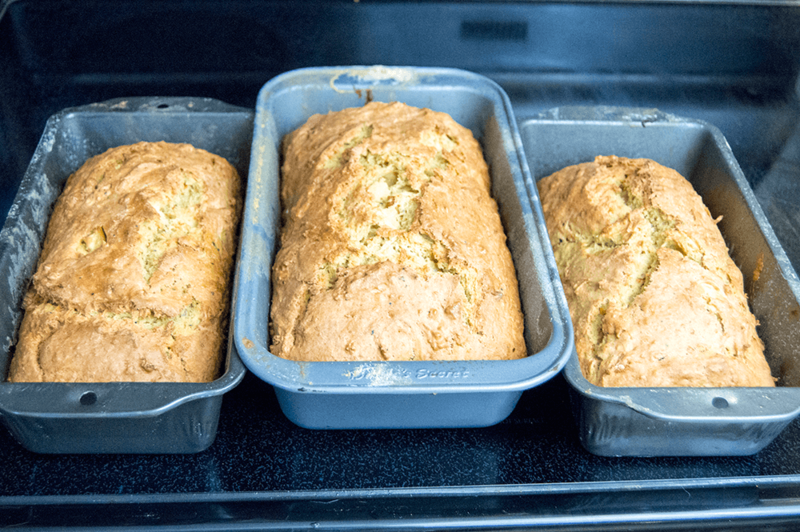 Pour the icing evenly over the tops of each loaf and let set. Enjoy within one week of baking!